It’s hard to believe that it’s been three years now since the Bjorkestra has performed in NYC (or anywhere, for that matter). I’m happy to announce that the Bjorkestra will return next month on May 1st at Joe’s Pub, which was, incidentally, where we played last in NYC! 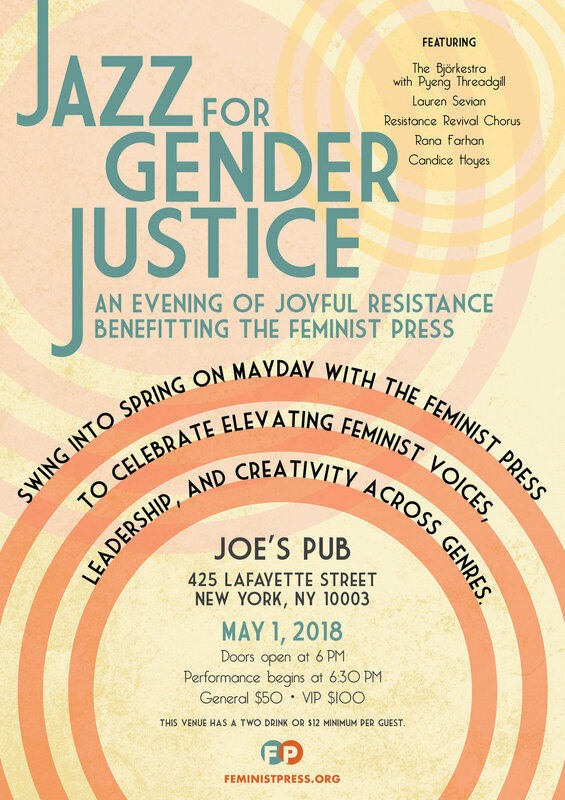 We’re going to be part of an exciting new event: “Jazz for Gender Justice: An Evening of Joyful Resistance Benefiting the Feminist Press.” I’m the Musical Director for this performance, and I’ve assembled an amazing roster of (primarily) female jazz artists. Headlining the evening will be The Bjorkestra, featuring Pyeng Threadgill on vocals, jazz vocalist Candice Hoyes, Persian jazz and blues singer Rana Farhan, baritone saxophonist Lauren Sevian, and the Resistance Revival Choir. We an excellent house rhythm section backing up the artists: Mary Ann McSweeney on bass, Joe Abbatantuono on drums, and Amanda Monaco on guitar. Also, joining the Bjorkestra will be trombonist Mike Fahn. Click here for artist bios and the event details. And click here for tickets!!! Come on out! It’s a very worthy cause: alll proceeds benefit the Feminist Press, a nonprofit founded to advance equality and amplify feminist perspectives.